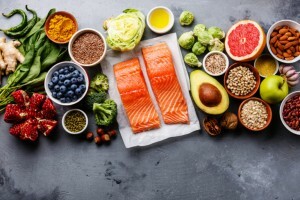 Eat Smart Diet & Nutrition blog » General Nutrition » PCOS – can nutrition play a role in the management? Polycystic Ovarian Syndrome (PCOS) is a condition which many women live with, and are unaware that diet and lifestyle can play a major role in helping manage some of the symptoms. Let us help you understand the symptoms and how small changes in your diet can make a big difference. PCOS is a hormonal condition which affects up to 1 in 5 girls and women in their reproductive years. It is caused by increased levels of male hormones in the ovaries which affect the menstrual system and can lead to infertility, enlarged ovaries and ovarian cysts. The cause of Polycystic Ovarian Syndrome is unknown, however, family history, insulin resistance, type 2 diabetes, lifestyle and environment can be contributing factors. How can PCOS be managed with diet? An eating plan designed to maintain a healthy weight can help to manage Polycystic Ovarian Syndrome. Include lean proteins and vegetables to promote weight loss. Choose Low GI carbohydrate sources – check out our blog for more information on GI. Try to spread your carbohydrates out evenly throughout your day. Breakfast, lunch and choosing a dinner of lean protein and vegetables when you don’t require as much energy. Combine proteins with carbohydrates at breakfast and lunch to regulate blood sugar levels and stay fuller for longer. Choose good fats such as olive oil, nuts, seeds and fish (salmon and tuna). Keep a regular meal schedule, 2-3 hours between eating helps to maintain blood sugar levels. Try to avoid sugary foods such as juices, dried fruit, smoothies, lollies, milky coffees, refined carbohydrates (pizza, rice crackers, white bread and snack foods) as these foods will spike blood sugar levels. If you are struggling to find a healthy diet and lifestyle for your symptoms, we can help provide you with simple and achievable changes to improve your health and manage your symptoms.